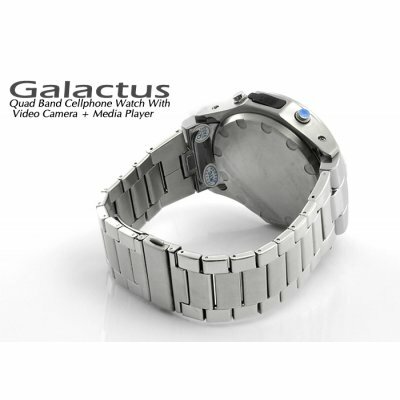 Successfully Added Galactus - Quad Band Cellphone Watch With Video Camera + Media Player to your Shopping Cart. Not only is the Galactus a wrist mount cellular phone, it also contains a digital still and video camera, making this unit a real wrist-top command center! Connect the watch to your computer and download your days photos and videos so you can relive all the days events. Nothing could be easier. This product is compatible with the worldwide standard GSM frequencies of 850MHz, 900MHz, 1800MHz and 1900MHz. Please check with your local provider if you are unsure of your local band requirement. Is the Galactus water proof?